HAPPY CAMP, California. 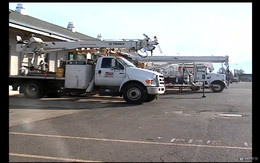 - A Pacific Power worker was standing in the basket of his bucket truck working to restore power in Happy Camp, when someone stole his truck. "An agitated and incoherent woman approached his vehicle, entered the cab, and attempted to drive away," said Nick Black, an officer with the California Highway Patrol. The worker was still up in the air. The suspect sped away, "despite the desperate pleas from the employee to stop and allow him to lower the extended boom," he said. That's when the bucket, with the man still inside, crashed into a power pole, throwing the worker to the ground, Black said. The worker suffered multiple injuries and was taken to Rogue Valley Medical Center in serious condition. "The woman has not been apprehended but the vehicle has been recovered," Black said. "The truck was located approximately 25 miles west of Happy Camp and 200 yards off of Highway 96 on a dirt road." Black said the truck was found in driving condition. California Highway Patrol is not releasing the suspect description at this time. Meanwhile, Pacific Power is offering a $10,000 reward for information leading to the arrest and conviction of the suspect.